This title covers the technical characteristics of the F-104 Starfighter, one of the most widely-used and popular aircraft in history. Although built in small numbers for the USAF, the F-104C fought and survived for almost three years in Vietnam. There, it was engaged in some of the war's most famous battles including the legendary operation Bolo, where seven North Vietnamese MiGs were destroyed w… ithout the loss of a single US fighter. This small, tough and very fast fighter, dubbed 'The Missile with a Man in It', was called upon to do things it was not specifically designed for, and did them admirably. 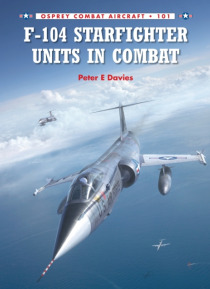 Featuring illustrations and photographs detailing the variety of nose-paint schemes and weapons configurations, this comprehensive appraisal of the F-104 Starfighter is ideal for modelling and aviation enthusiasts alike.